Lock in a great price for Fiesta Resort All Inclusive Central Pacific - Costa Rica – rated 8.4 by recent guests! Both the lunch and dinner options were very good. Everything tasted great! 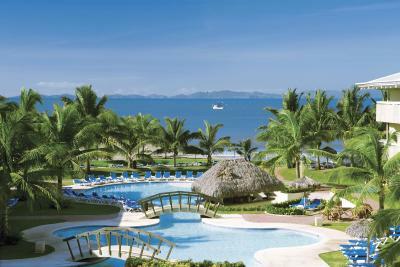 Wow, were to start.... they let us check in early, at an all inclusive! The rooms were big, AC worked great, beds were super comfy. 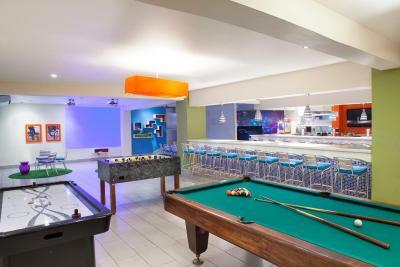 The pool and the entertainment is what really made our stay. It was huge! The pools were so nice and well cared for. Michel, the person in charge of the shows must have worked for a cruise ship or something, they were Vegas worthy and incredible, they really put their heart and soul into them, don't miss them if you go. The hot dancer guys were in charge of the pool aerobics, which we did. 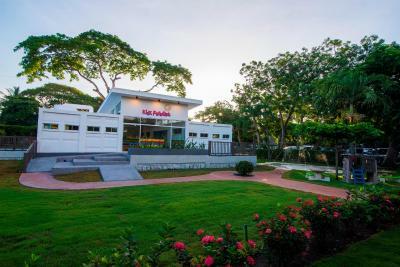 One thing to take note: this is a place for Ticos, only 4 Americans were here. 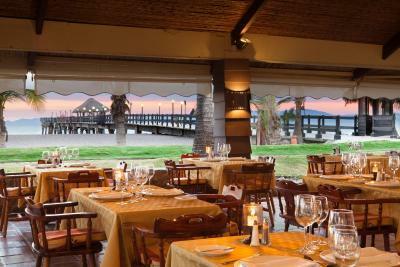 We liked that fact, the food catered to Ticos, but was fenomenal, specially at the specialty restaurant (we did the steakhouse). Very family oriented, the only drunk guy here was an American. We went to the neon foam pool party after the show, and it was amazing. I don't think I have ever had this much fun at an all inclusive before. The grounds were clean and beautiful. Staff was friendly. 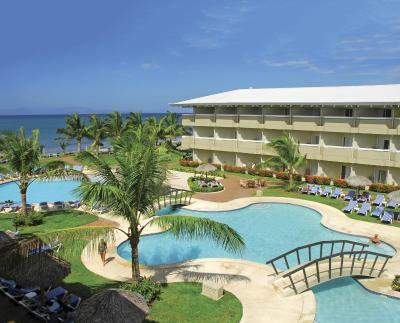 Clean, good service, good food, beautiful hotel and beach, great popsicles. 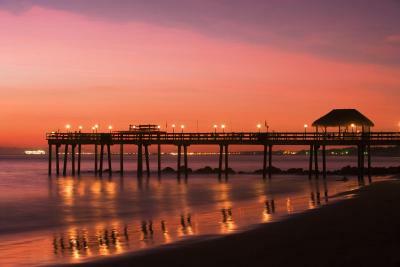 The people were great and the beach/pier was nice. 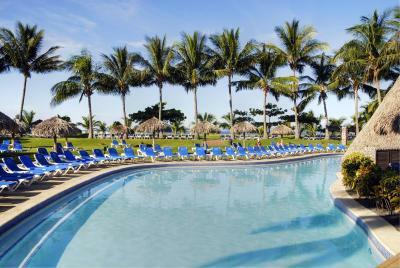 The pool and grounds were clean, and the rooms were comfortable and bug-free. 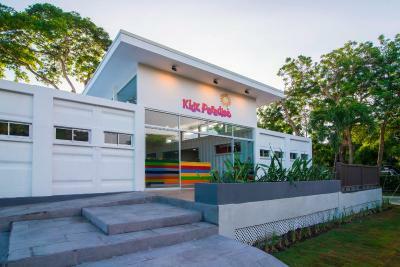 Plentiful fruit, adult drinks and juices. 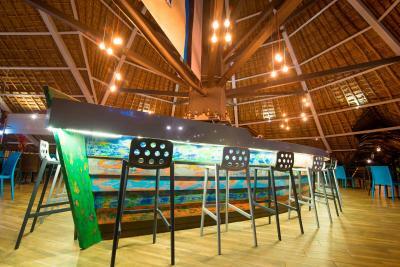 Atmosphere was great, pool restaurant was well stocked and the juice bar was really good. 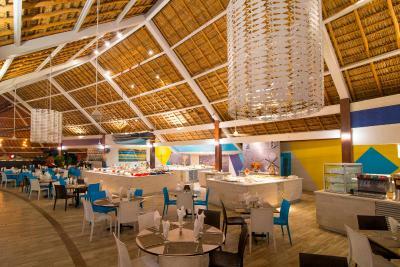 The food on the resort is not the best but Bungalow Beach right outside the front entrance is AMAZING. The room was fairly clean, and was nice to come back to at the end of a long day. The food was amazing, and the staff was very friendly. 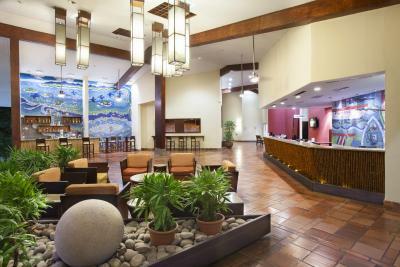 Arena's Travel tours within the resort was great for planning excursions outside of the hotel. Karen from the Premium pool side staff was AMAZING! She is personally one of the best customer service employees we have ever encountered. 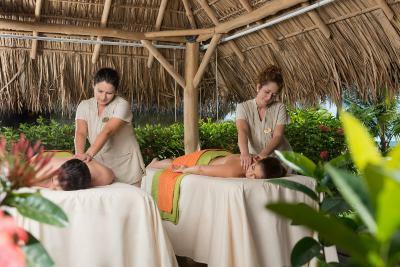 Fiesta Resort All Inclusive Central Pacific - Costa Rica This rating is a reflection of how the property compares to the industry standard when it comes to price, facilities and services available. It's based on a self-evaluation by the property. Use this rating to help choose your stay! 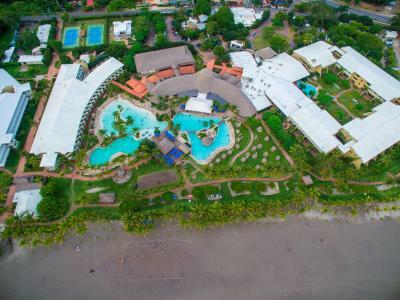 This all-inclusive seafront resort in Puntarenas offers a large volcanic sand beach area, several outdoor pools with sun terraces, and a variety of bars and restaurants. Palo Verde National Park is just 6.2 mi away. 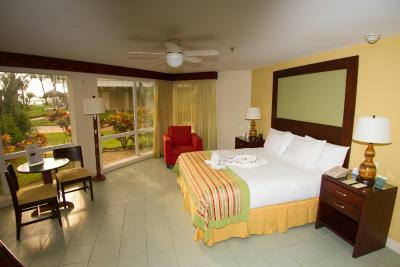 The air-conditioned rooms at Fiesta Resort All Inclusive Central Pacific - Costa Rica are decorated with fresh colors and dark wooden furniture. 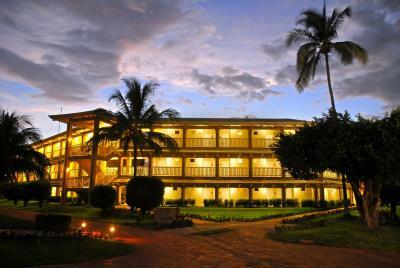 All rooms have cable TV, luxurious bed linens and tea and coffee-making facilities. 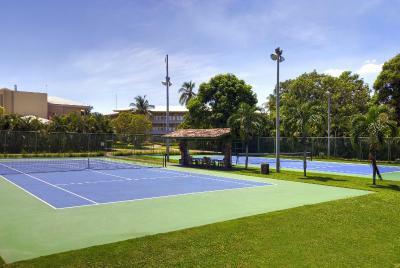 Guests can work out in the gym or play tennis on the on-site tennis court. 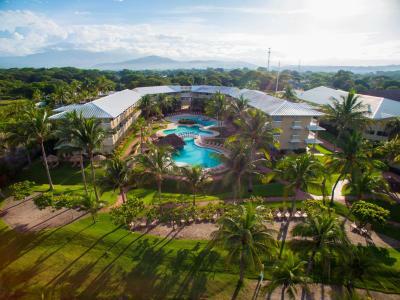 Fiesta Resort All Inclusive Central Pacific - Costa Rica also offers free non-motorized water sports, clubs for kids and teenagers, daily activities and live entertainment every evening. 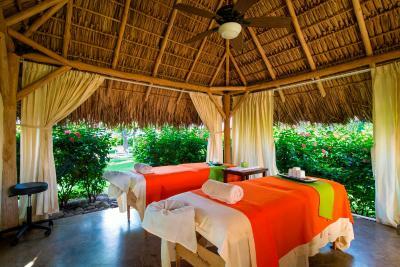 The Heliconia Spa offers massages, body treatments, body wraps and facials in a secluded ocean-front area surrounded by tropical gardens. 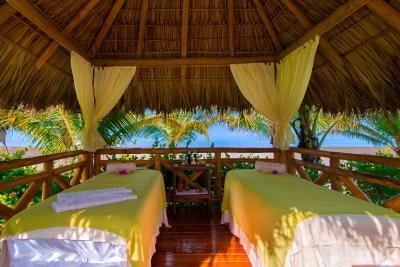 Heliconia Spa has 2 double and 2 single treatment bungalows and a revitalizing hydro-massage tub. 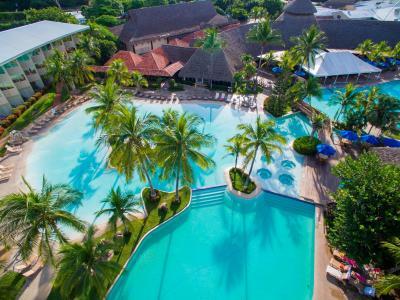 Fiesta Resort All Inclusive Central Pacific - Costa Rica’s tour desk can help plan tours to Costa Rica's many natural attractions, including Tortuga Island, Monteverde National Park, Arenal Volcano, and Manuel Antonio Beach. 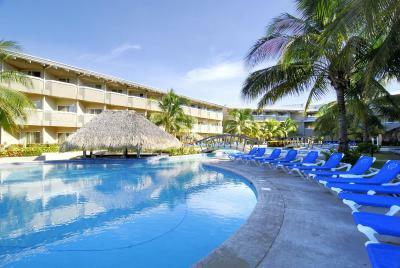 You can enjoy all-inclusive food and drinks at the Fiesta Resort All Inclusive Central Pacific - Costa Rica. 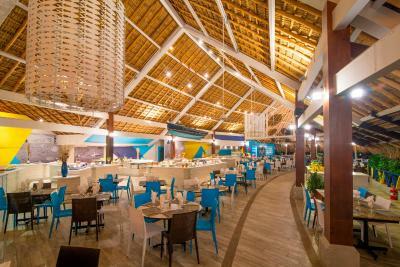 Local and international meals are available at the various bars and restaurants, which range from casual poolside snack bars to elegant à la carte restaurants. 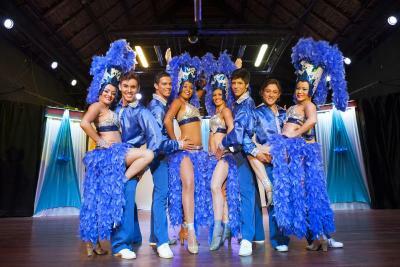 The buffet restaurant offers nightly themed dinners. 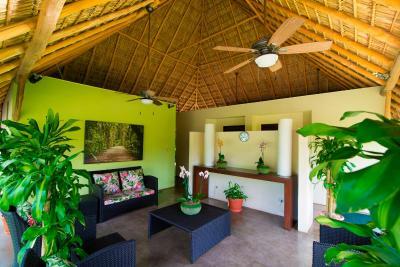 This property also has one of the top-rated locations in El Roble! Guests are happier about it compared to other properties in the area. 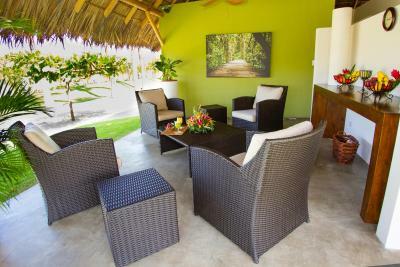 This property is also rated for the best value in El Roble! Guests are getting more for their money when compared to other properties in this city. 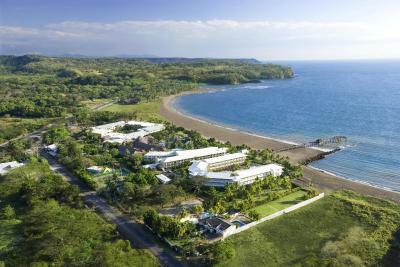 When would you like to stay at Fiesta Resort All Inclusive Central Pacific - Costa Rica? 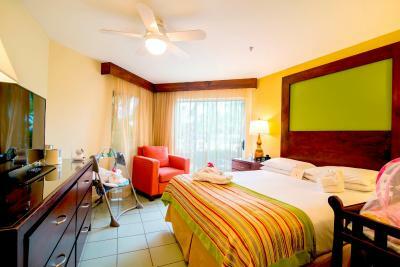 This room features air conditioning, a desk, heating, cable TV and a private bathroom with bathtub or shower, hairdryer and free toiletries. 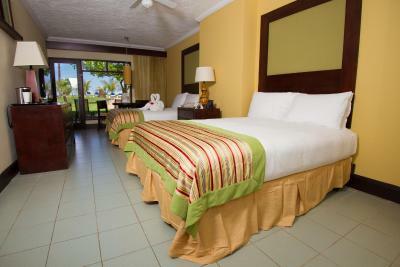 This suite features air conditioning, a desk, heating, cable TV and a private bathroom with bathtub or shower, hairdryer and free toiletries. It has garden views. 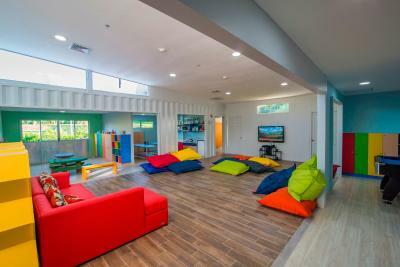 This room features air conditioning, a desk, heating, cable TV and a private bathroom with a bathtub or a shower, a hairdryer and free toiletries. The balcony has partial ocean views. This room features air conditioning, a desk, heating, cable TV and a private bathroom with bathtub or shower, hairdryer and free toiletries. It also has garden views and a coffee maker. This nonsmoking Junior Suite features whirlpool, air conditioning, cable TV and radio. The private bathroom comes with bath or shower, hairdryer and free toiletries. 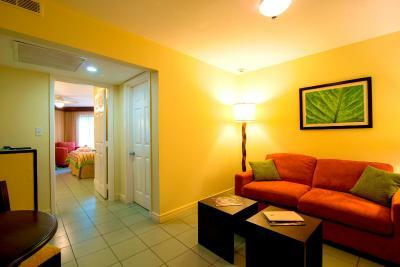 This double room has air conditioning, cable TV and a desk area. The private bathroom comes with bath or shower, hairdryer and free toiletries. 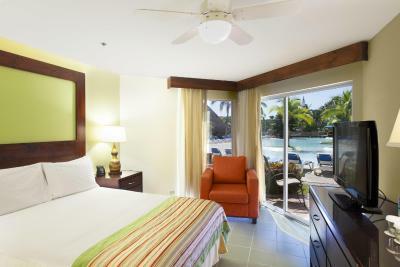 This suite features air conditioning, cable TV and pool view. The private bathroom comes with bath or shower, hairdryer and free toiletries. 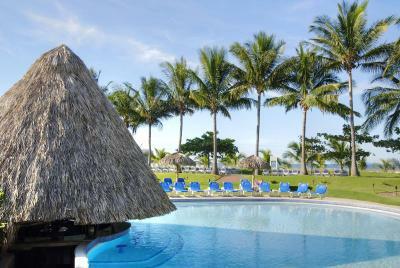 WiFi is available in the hotel rooms and costs USD 10 per 24 hours. 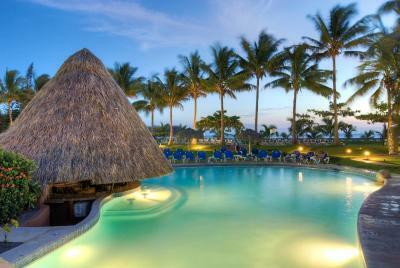 House Rules Fiesta Resort All Inclusive Central Pacific - Costa Rica takes special requests – add in the next step! 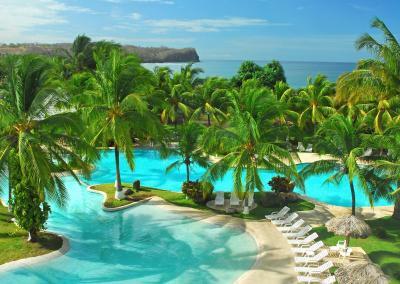 Fiesta Resort All Inclusive Central Pacific - Costa Rica accepts these cards and reserves the right to temporarily hold an amount prior to arrival. The pastries in the breakfast buffet were very plain. Also, I didn't enjoy the music or pool activities. 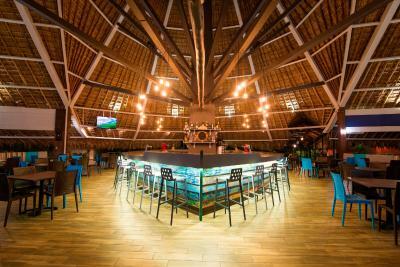 By the way, even though the pool closes at 9pm, the tower stand and pool bar close at 6pm. 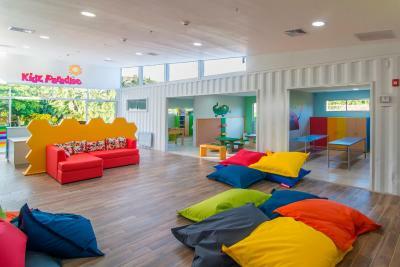 The main negative thing for us was the rudeness of some of the staff. The room had a weird smell, like pesticide and humidity. The AC was not working properly (couldn't go below 73). Also, the lock of the windows was not working and we didn't noticed until we were leaving (maybe this explained why the AC wasn't cooling enough). The food was good, the pool was nice and clean (last time I visited it was dirty with bird poop (a LOT of bird poop) but I was surprised to find out this time it wasn't). The staff was great, everyone was happy and helpful. The hotel is perfect! Just not many things to do if you want to go out, but really not necessary to do so, everything you need is here. The beach is a volcanic, black sand beach. It's beautiful, but not what you might be expecting. The beach was awful, you can't really go in the water and the sand is so dirty that's unpleasant even to walk on. 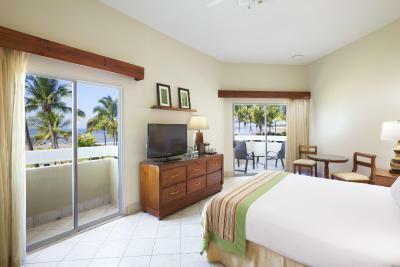 Most of the rooms doesn't have terraces and you can't even open the window so there is lack of fresh air in the room. The entartament was mostly at Spanish so you can really perticipate if you are an english speaking tourist. 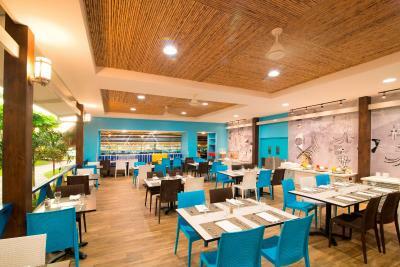 The pluses: The staff was very nice and accommodating. The food was also good. Greate variaty and options. The had some good theme dinners as wine tasting. It's ok for a short stay of 2-3 days. Shows was great but Hispanic spoken only , and actually you can see just a few people from anywhere else there so you may feel withdrawn there and the personnel is not really welcoming you. When someone took all the things from our table even our belongings when we went to grab some fruits (it’s a buffet only place with very little food choices ) I was yelled at that it was my fault. Very over priced. If you’re a little upper class don’t do that mistake to choose this place. 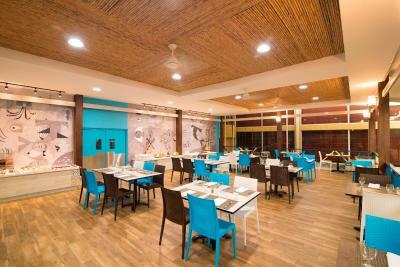 Spacious room, good selection of food and drinks, friendly staff. I wish we stayed more than only one night (our last one). Truly relaxing place after travelling the entire CR and staying at some wild places. So many things! First, our ac was not working and blowing musty air. They sent three people to "fix" it, and our temperature in the room just kept rising and everything was damp. After going to the front desk for the third time our last night, the lady at the desk was rude and said they had been calling us. I explained we were out enjoying the beach and she was still rude so i asked for a manager. The manager was very nice, but he only offered us a smaller room with not much ac imrpovement. So, in the end we ended up staying in our original room and just sweating. Now the food was also unsatisfactory as well as the alcohol. 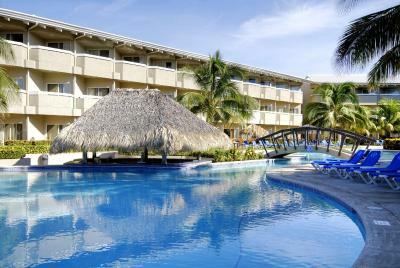 Everything was just seemingly cheap, this was our first all inclusive experience, so I am not sure if that is normal. There are restaurants on site but it is possible to get a reservation, so you just have to settle for the buffet. The rooms need immediate renovation, there are no slippers,mini bar not even a fridge, no balcony even a opening window, We requested to change the room (there was availability on booking.com) refused and none of the reception communicated with us on this subject and generally the accommodation does not correspond to 5 star hotel!